I've heard she will do service as a hotel ship at some shipyard. Yes I heard that accommodation ship was the immediate plan, but I don't know exactly where...supposedly not too far from Bergen. Haven't been able to check what happened today. I'm now in London, and fly back to Edinburgh tomorrow. I read on a other forum that she will be 45 days at Ågotnes shipyard. Well you probably realise I’m back in Scotland – since Sunday evening actually, but it took a few days to loose my sea-legs after such a super voyage, especially as regards lack of buffet breakfast and the extra effort required to top up my coffee mug! My travel mascot Sea-Troll seems to have already posted some photos while I wasn’t looking, and I’m just about to post a couple in the CVF family album thread. I’m going to concentrate on posting in Nordsternen’s thread. This will illustrate the voyage itinerary in outline, with photos from each place (rather like I did on last years Nordnorge trip), and there will be interior and exterior ship detail photos also. After that (or maybe in parallel when I have more time), I will post other photos from the voyage in appropriate threads, such as threads for places in the Norway section. Plus possibly hotel room views from start and end of the trip and miscellaneous passing ships of various kinds as usual. Oh and there are definitely some “Abandoned houses and Properties” to come, and even an already posted “Architect designed dwelling of the modern Norwegian” ! But all this will mostly be at a more leisurely pace…and I do also need to find time to continue to drip-feed our Captain with Thailand photos . 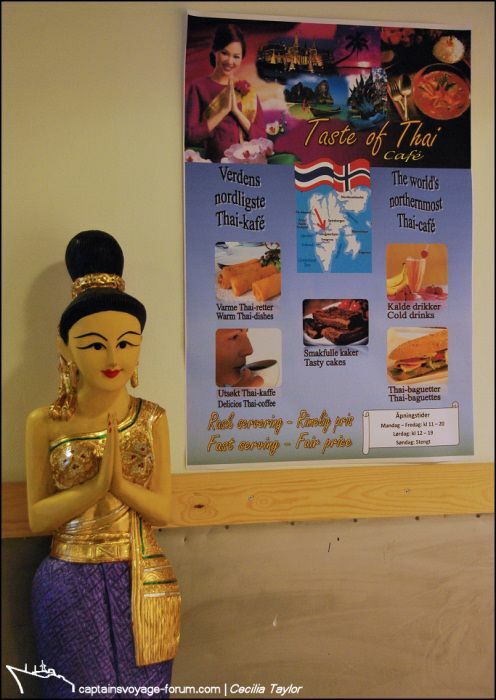 The World’s Northernmost Thai Café! I learnt some time ago that the largest non-Norwegian group in Longyearbyen is actually Thais. Surprising, isn't it??? As those of you who I had hoped to catch up with during the last eight months already know, D has had some health problems and as he doesn’t have any other family support I have been giving what help I can. Anyway, following a long period of tests and so on, it would seem that there is no hugely serious problem, more a matter of managing a long term condition, though that is in some ways harder to cope with. Anyway, at one point when he had a better day I found myself talked in to accompanying him on a holiday and a booking was made. Now I know I have mentioned before the lack of a name or generally accepted expression to describe my relationship status, but perhaps this –yes, CRUISE – holiday might seem an extreme solution to allowing me to continue to call D “cabin-mate”! I’d been about to tell you about it at the beginning of the month (when I really started to believe that D was OK to travel and it might actually happen), but, well, I thought on April the first you might think it was an April Fool joke if I told you I was cruising to Edinburgh’s port Leith!!!!!!!!!!!!!! But that is exactly what I’ll be doing! …a week today I (oops sorry I mean we) fly down to London, board the ship that then cruises around England (Portsmouth, Isles of Scilly), Ireland (Cobh, Dublin), The Isle of Man, Scotland (Iona and Staffa, the Isle of Skye, Orkney, and LEITH), and continues to Germany –Hamburg, a couple of nights stay, and fly back to Edinburgh. I suppose the circumstances prevented me from enjoying and sharing the “looking forward to” phase with my customary enthusiasm, and to be honest it wouldn’t have been my first choice of holiday on which to spend a fortune, but hey, it’s on FRAM! ..…and in a strange way, the prospect of arriving at my “home port”, experiencing it from a different angle in total turnaround before sailing off again, is actually the bit I’m most excited about. Maybe it’s a metaphor for what I need in my life going forward. Now, that's a great way to enjoy spring, I'm very happy to hear about your plans! beeing a toerist in your own country,seeing it from the other side. and to be honest it wouldn’t have been my first choice of holiday on which to spend a fortune, but hey, it’s on FRAM! How I envy you this cruise! Have a good trip! Enjoy it, Cecilia! When you return you will think back with happy memories on all you have seen and experienced . Thank you all for your kind comments, and Sigve I was especially thinking of you (and the “signature motto” on your posts) where Fram is concerned. I suppose another “might have been” has been lingering at the back of my mind. When these domestic obligations arose last year I had been just about to book on the voyage of Serenissima that will take her from Aberdeen across to Norway for the first time in her new name. Now what a way to spend a fortune that would have been! Having so closely followed pakarang’s journey, I certainly want to travel on her one day. Meanwhile, as I pick myself up, I’m thinking I might just get across to Norway this summer to see her arrive. I’m thinking more “spontaneous” than “planned”, perhaps dashing around in the way I did when pakarang brought Korsfjord to Norway. It’s an exciting thought, and anticipating the possibility actually makes me look forward to the Fram voyage so much more positively. Oh, just to clarify things for Fram-followers… her trip at present in Norway continues via Shetland and Orkney and then calls at Leith on Sunday. Do NOT be confused …this is NOT when I’ll be onboard!!!!! She goes on to Newcastle and that trip ends in London. I’ll be flying down to London Tuesday morning and staying near Tower Bridge on Tuesday night, near to where Fram is moored (not Greenwich as stated in some of the brochure itineraries), and embarking on Fram on Wednesday 1st May. Hope You will both have a nice cruise! And we are of course looking forward to a detailed report, and one rich on pictures! (I should have liked to do this cruise myself....!). Bon voyage! Forget the circumstances for a while, Seagull (after all, isn't it what this trip is meant for?) and take it all in! Our turn to follow you and await impatiently your return. I really hope this trip will soothe a bit of your worries. Visiting your own country and town from a different perspective, this must be interesting. Have a wonderful trip, will give you a wave when you sail up the west coast!! I'll be in London Tuesday-Friday. Whereabouts will Fram be moored, Cecilia? I might try and find her.